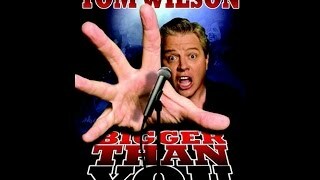 Tom is most well known as "Biff" from Back to the Future but, he is also one of the premiere stand up comedians in the country, boasting appearances on The Tonight Show with both Jay Leno and Johnny Carson, David Letterman, Regis, as well as Good Morning, America, The Today Show, and CBS This Morning. Internationally he's appeared on Tonight Live in Australia, Good Morning, Great Britain, and literally hundreds of television and radio programs around the world. He's starred in comedy specials on NBC, Global Television in Canada, and on myriad cable networks, and has written and performed his one man show, “Cowboy Tommy” to critical acclaim and full houses across North America.Fanatically eager to get onstage, when Broadway didn’t answer the door quickly enough, he began performing stand up comedy in his teens, while studying to be an actor in New York. Within a short time, he was headlining in comedy clubs up and down the east coast, and moved to Los Angeles soon after that. Accepted as a regular at the world famous “Comedy Store” on the Sunset Strip on his first audition, at 21 years old he became a member of the “Comedy Store Players”, improvising onstage with the likes of Richard Pryor, Robin Williams, and the large group of comedy colleagues who formed the nexus of the modern comedy boom.He's appeared in some twenty-five feature films, including his “Saturn” award winning performance in the now classic Back to the Future trilogy, and has recently been a part of the Spongebob Squarepants phenomena, performing many voices in the Nickelodeon series, as well as the Spongebob Squarepants Movie. He's been a recurring character on many television shows, including Ed, Freaks and Geeks, Do Over, Titus, Maggie, Fired Up, and been a guest star on Cold Case, Still Standing. Reba, George Lopez, Boston Public, Zoey 101, Rodney, The Facts of Life, and many more. Early in his television career, he was even chased by international mega-superstar and recording artist David Hasselhoff on the show Knight Rider. But the stage is where he feels most at home. He has performed as a headliner at the top comedy clubs in the country for years, and for tens of thousands as an opening act for Rodney Dangerfield, and rock bands such as Three Dog Night, Fleetwood Mac, Missing Persons, and The Tubes. He has performed his act for corporate events of every kind, from a small, select group of one hundred or less, to Las Vegas conventions of many thousands, with his trademark blend of energy and fun, without the use of easy vulgarity and material met with fewer laughs than gasps of discomfort. He's performed for audiences as diverse as a screaming rock and roll stadium, to a large conference made up largely of priests and nuns. And he had both crowds roaring.